Go Ga Ga for Gogola! I knew as soon as I saw this recipe that I would be trying it shortly. I saw this recipe at the New York Times Cooking website and immediately thought it would be a good idea. 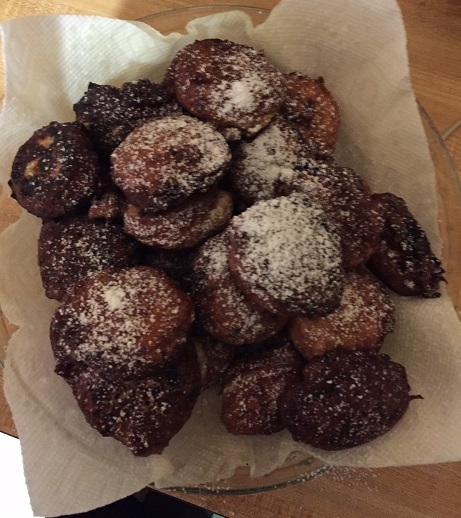 The recipe is for gogola, which are banana beignets that are traditionally served as par of the Hindu holiday of Phagwah. 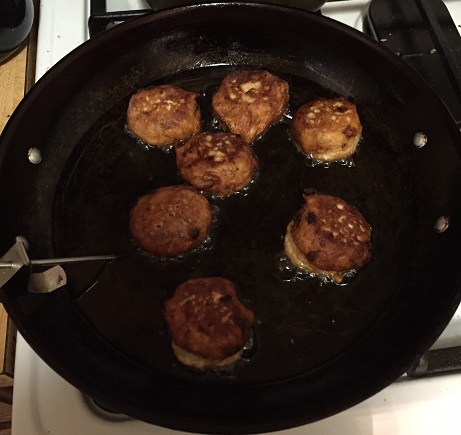 They are basically a lot like fried donut holes except the make use of some great ingredients and, of course, bananas, which are one of my favorite things to have in desserts. This recipe is very easy to put together with just a few ingredients, so if you have some very ripe bananas on hand this can be a perfect use for them. Using a potato masher or large fork, mash the bananas in a large bowl. Add the vanilla extract and almond extract and the sugar, and mix the ingredients well. In another bowl, mix the all-purpose flour, baking powder, nutmeg and cinnamon. Combine the flour and banana mixtures and pour in the evaporated milk. Mix until the mixture is smooth and thick, like waffle batter, adding a little more evaporated milk if needed. Set the batter aside to rest for at least 10 minutes or up to 1 hour. Heat 2 to 3 inches of vegetable oil in a heavy pot set over medium heat to 350 degrees. Drop the batter by heaping teaspoonfuls into the oil and fry until the beignets are golden brown on both sides, turning once when the edges are firm, about 3 minutes. Drain the beignets on paper towels. Cook just a few at first and taste one to make sure that there is enough sugar included and that the insides are cooked through. If the inside is runny, reduce the heat so the gogolas cook more slowly. Cook the remaining batter in batches. Serve the gogola immediately, or keep them warm in a 200-degree oven for up to 2 hours. Sprinkle the gogola with powdered sugar just before serving, if desired. These were an incredibly tasty treat that made a perfect dessert. They were just a bit sweet with great banana flavor throughout and they were just the right bite size where you could have a few (or ten) and really enjoy them. This is a good alternative to making a donut recipe as it may not take as much effort and they were great for dessert or as a nice breakfast treat with a cup of coffee in the morning. This would probably be good with other fruits besides bananas as well if you wanted to try something different.